(PRESS SEC) – On July 15th, 2015, the Prime Minister and Minister of National Security, Dr. the Honourable Timothy Harris, unveiled details of the Royal St. Christopher and Nevis Police Force’s Six-Point Plan. The plan hinges on i) Crime Prevention, ii) Intelligence-led Policing, iii) Targeted Operations, iv) Collaboration with other Agencies, v) Engagement of Stakeholders, and vi) Improvement in Administration. The urgency of the crime situation was brought home on February 16th, 2015, the day that Team Unity won a resounding victory at the polls. That’s because the seventh homicide for the year occurred on Election Day. The next day, the eighth homicide for 2015 took place. 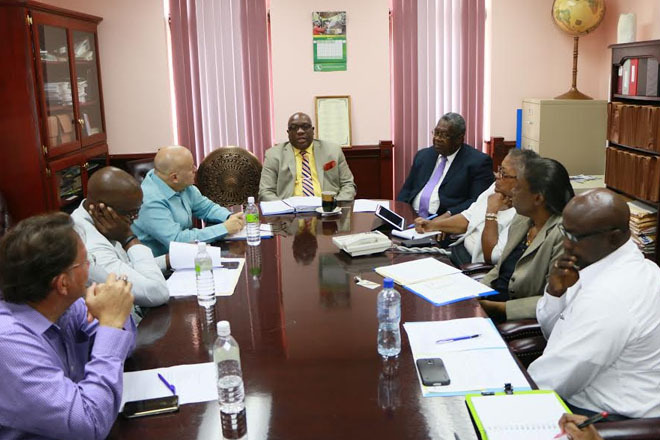 One week after the launch of the Six-Point Plan, high-ranking officials from both the Royal St. Christopher and Nevis Police Force and the Chamber of Industry and Commerce (CIC) held a meeting on July 22nd, 2015. Then, effective April 1st, 2016, the Cabinet of Ministers removed all duties and customs service charges, until December 31st, 2016, on all surveillance equipment to be used by households and businesses. The Police High Command and officials of the Chamber of Industry and Commerce last met on June 3rd, 2016, “to discuss the way forward in the fight against crime,” according to a statement issued jointly by the two organizations on Friday. The meeting was held three days after Commissioner of Police Ian Queeley affirmed on May 31st that, “We have always regarded the Chamber as a valued partner and will endeavor to keep it that way.” During the meeting, Commissioner Queeley and his team updated the Chamber officials on the successes achieved by implementing the Six-Point Plan and the 2016-2019 Police Strategic Plan in general. “Both institutions are in agreement that the fight against crime requires the cooperation of the entire civil society and the involvement of other community-based organizations. Both parties also agreed that the meeting was fruitful and have committed to closer collaboration as we work together to ensure citizen safety by creating and maintaining a secure environment where we can live, work and do business,” the last two sentences of the joint statement read.